As a new plaque is unveiled in Dublin marking the Beatles’ two chaotic concerts at the Adelphi cinema 55 years ago today, Alan Corr looks back on the night that Dublin turned fab. "She had brought in a tray of coffee and cakes in a nice, normal, sensible fashion, walking across the room and setting down the tray. Suddenly, she flung off her cap, dropped to her knees and cried, ‘I’m going to pray for you, boys! I’m going to pray for you!’"
It was November 7, 1963 and Beatlemania had hit Dublin. As that hysterical waitress served John, Paul, George and Ringo up in the Gresham Hotel, around the corner on Abbey Street all hell was breaking loose outside the Adelphi cinema. That night, The Beatles would play the second of two shows on the same day in Dublin, just one month after the word Beatlemania had been coined. That waitress episode, recalled by Colm Keane in his excellent 2008 The Beatles Irish Concerts, is just one of the many scenes of minor and major chaos that rocked the capital city that fatefully fab night. 55 years later on Wednesday, November 7, 2018 a long-awaited and long deserved plaque has been unveiled in honour of that night and those two shows. When they stepped on to the stage of the Adelphi in collarless mohair suits, the Fab Four were met with a rain of jelly babies (George’s favourite sweet) and the hysteria erupted. The set list for both shows (one at 6.30pm and one at 9.30pm) was I Saw Her Standing There, From Me To You, All My Loving, You Really Got A Hold On Me, Roll Over Beethoven, Boys, Till There Was You, She Loves You, Money (That’s What I Want), and Twist And Shout. In the monochrome world of insular little Ireland in 1963 it’s hard to believe now how crazy Dublin went that night. After the first show "a good-natured" riot broke out on O’Connell Street and 250 gardaí, 20 squad cars and a black maria were called. Good-natured or not, 50 people were injured, three hospitalised and 12 arrested. "There was a moment when I said, ‘Oh, oh, I’m in a war zone here’," says one fan in The Beatles Irish Concerts. "‘Something terrible is going to happen.’ This crush started. I got terribly claustrophobic. All you could see was heads and bodies right up Abbey Street. Cars were overturned." "The Morning After The B-Storm" ran the front page of The Irish Press. Of course, not everybody was as euphoric as the rioting youth. 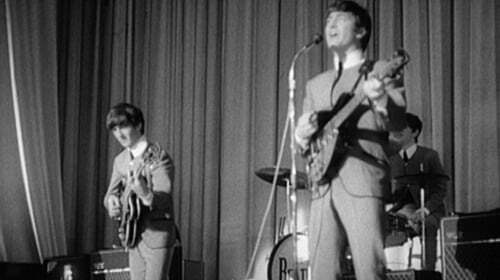 A report by Pathe News, using footage filmed by Gael Linn, began with "Beatles make unwelcome visit to Dublin". Writing in his weekly column in the (then) RTV Guide, poet Patrick Kavanagh thundered: "A more untalented outfit was never inflicted on us". However, the Guide’s pop critic, a hip young gunslinger by the name of Gay Byrne, was more on the money, writing in his weekly column that the squares just didn’t get it. In fact, Gay returned to the site of the concerts today for the plaque unveiling and recounted how the Beatles had asked him to be their manager when he was working in the England in the early sixties. The Beatles returned to Ireland to play Belfast again the following year but plans for further shows in Dublin, Limerick and Cork were overtaken by the global outbreak of Beatlemania. But for one magical, rainy night in November 1963 Dublin was truly fab.